Backyard Grill Restaurant in Chantilly offers a delicious and varied lunch and dinner menu. Listed below are the appetizers, salads, soups and entrees we offer. If you have any questions, please contact us. We are happy to serve you! Topped with provolone cheese and fresh salsa, served with lettuce and tomato on a Bioche bun. Our moist dark chocolate cake covered with dark chocolate and filled with a dark chocolate truffle that melts out. Served a la mode. Our light but buttery vanilla flecked cake has waves of caramel cake along with a salted caramel crunch layer, a creamy custard layer and a smooth caramel top. Moist yellow cake filled with Italian lemon cream, finished with vanilla crumb and confectioner’s sugar. Deep fried, topped with powdered sugar, caramel and vanilla sauces. Flour tortilla stuffed with homemade cheesecake rolled in powdered sugar and cinnamon. Served with strawberry sauce. Contains or may contain raw or under-cooked ingredients. Consuming raw or under-cooked meats, poultry, seafood, shellfish or eggs may increase your risks of food-borne illness, especially if you have a medical condition. So sorry that we don’t have vegetarian dishes listed on the menu, but we can cook anything for our guest to there liking as requested. We are a starch free kitchen, we make everything fresh. We are here to make all our customers happy. I hope you will give us a try and we hope to see you soon! Do you have all you can eat crab legs? Raj, they have a great menu. If you do not like the veggie selection then go to a vegan or Indian Place. Not every plate can be satisfied every grill or eatery. Like Raj, I am very disappointed at the limited number of vegetarian/vegan options your restaurant offers. I mean, Burger King has a veggie burger. All we are looking for, really, would be a veggie wrap of some sort, a few sides, and maybe a veggie burger or pizza…all things that cost efficient and crowd pleasing, for both dieters and vegetarians alike. It cracks me up when people complain about lack of vegetarian options. I thought the management response was great but you know what, This is a BIG country, and MANY different food options. Why can’t a restaurant be good and not get criticized for not having vegetarian. If you can complain about that, why can’t I go into a vegetarian only restaurant and complain they do not serve meat? That is the problem with todays society, and its a shame. Good luck finding a vegetarian restaurant.. Ordered delivery from you guys the other night and it was great! Even made me shrimp scampi not on the menu, Ordering again right now! The crab cake dinner was phenomenal!!!!!!!!!! Lots of crab meat, very little breading. Definitely top 3 on the crab cake scale!! To the good folks who criticize those asking for plant-based options: yell while you can. Your heart disease or diabetes will shut you up soon enough. Every restaurant should have healthful menu options. This is not catering to a special palate. This is recognizing that the SAD (Standard American Diet) is not sustainable for the planet, deadly for our health, and incomprehensibly horrible to the animals. Thanks for your comment on our website. We do have delicious desserts. We’ll be posting them up on the website shortly. Feel free to call us at (703) 802-6400 or if you come in we have dessert menus on every table. Why don’t the desert items have prices? All the other items have prices. please add the daily specials to the menu listing. Wow.. don’t see any vegetarian menu in entire list. I thought i will able to get Veggie burger but no luck 🙁 We cant entertain ourselves in Backyard Grill. Great food & service! I had the Amore Steak & Shrimp was soo good! Was full & couldn’t stop eating.Our server was excellent! I love the management response to “vegetarian options” and will try this restaurant today for lunch. The menu looks good. You want a wide variety of vegetarian options? Go open a restaurant, fill the menu with vegetarian options, and give Rasmus a call in 2 months to auction off your fixed assets when it fails. So sick of whiners who feel the need to open their mouths when something doesn’t conform to their chosen way of life. Incredible Menu. Looking forward to taking my husband out on Father’s Day. See you then. Love this place! Ps- salad is a vegetarian option. I don’t think you guys should change a thing. Your menu selection looks amazing! So much more variety than anywhere else I’ve researched. Can’t wait to get there and try it out. We are on our way now! Just finished having an excellent lunch with my husband and momma. We couldn’t have had a better experience! Everything from our fantastic server (Ash) hospitality to the deliciously prepared food was amazing! The superb service, efficiency, generous portions, atmosphere and cleanliness of this eatery is top notch. We especially loved the option of the outdoor dining area! our menu selection looks amazing! So much more variety than anywhere else I’ve researched. Can’t wait to get there and try it out. We are on our way now! THIS PLACE ROCKS!!! FOOD IS SOO GOOD, AND FRIENDLY STAFF AS WELL! So, were the vegetarian burger and Margarita flat bread added after people asked for veggie options? I think people reacted so negatively to the vegetarian complaints because they came across as whiny. @Sue, studies have shown that 100% of the people who mix eating food and sucking oxygen die eventually. When Jesus returns, the planet will be cured so no worries on that front. All people that complain about the lack of vegetarian options, lack of dessert options, etc. Good grief, it’s a grill folks, and a good one. It serves meat; humans are omnivores not herbivores. If you want a vegetarian dinner there are many options out there. It’s kinda like someone complaining that McDonald’s does not serve halal. It’s not a middle eastern place. Halal, I am sure, is great. So are hamburgers. You don’t get both in the same place. Some vegetarian dishes are great. I go to a vegetarian place when I want lots of vegetarian choices and to a grill when I want lots of meat options. I was craving a good shish-ka-bob and thought that your place would be just right . . . but alas, not a single shish-ka-bob on the menu! Lots of other yummy sounding things on the menu though – Monte Cristo, Fajitas, Crab Cakes, Prime Rib. I used to get fried cheesecake balls served on a bed of whipped cream with hot fudge dipping sauce at another restaurant – it was to die for. Yours is the first restaurant I have seen since that restaurant closed that offers fried cheesecake. Can’t wait to try them. I have not eaten at a Backyard Grill yet. I have a coupon so I will be trying it. You use to have a good fresh catch of the day option. Don’t know what happened but all you serve now is tilapia. Tilapia is not really a good fish. I have given up on your fish menu except for the salmon that you serve regularly. Please think about adding other fish to your fresh catch menu as Fresh Catch of the Day. Maybe think about adding swordfish, haddock, Cod, Bluefish, or grouper. Just some suggestions to think about. Again tilapia is not really a good fish!!!! You can do much better than that! I see PLENTY of vegetarian options on your menu! Quesadilla minus the chicken. Potato skins, spinach/artichoke dip, nachos are all veg options. All salads minus meat. All sides. Ask for veg fajita. Alfredo pasta no meat. I see 2 flatbreads that don’t have meat. All wraps minus meat are options. Sometimes you just need to get creative. Just because there’s no vegetarian section doesn’t mean you can’t eat here. It would great if you could post which items are gluten-free. If you like pasta, order the Chicken Alfredo and add shrimp!!!!! Amazing!!!! This place is great! Even moreso because they don’t cater to the whiny and pathetic vegan crowd. Highly recommended. If you have strict dietary requirements – STAY HOME. Very Sad. Not many vegetarian options. Would like to try your restaurant. Do you have any gluten free options other than salad? Thank you for the delicious food delivered for teachers today! Everything was just as we asked (with accommodations and all). The delivery staff was very kind, too! Seriously Raj and others who are complaining about no veggie selections?? This is a bbq and bar just like name suggests not a vegetarian dig. It’s like me complaining about not having meat selections in vegetarian restaurant, pretty stupid. It is a great BBQ place. Jay’s comment is 100% on target. I don’t see vegans/vegetarians complaining about the absence of meat at the vegan/vegetarian restaurants. The manager stated clearly they could improvise and make several dishes if they requested it. Accept it and quit complaining. Why is it that the minor few insist on everyone catering to their wishes. After reading the comments, I actually counted the number of different options for vegetarians. Twice a week there are 39 choices of vegetarian entrees or sandwiches. The other days there are 27 different vegetarian options. All this from a restaurant that calls itself a “Grill” (which is generally accepted as a restaurant that cooks meat on a grill) – and it gets slammed for not having enough vegetarian options?? Can the vegetarians please tell me which “Vegetarian” restaurant will provide me with a choice of 27-39 different entrees or sandwiches with meat so that I may have the choices I’m looking for? We have been visiting the Backyard since it first opened (then it was the Backyard Steak House). We have always had courteous service and great menu selections. They have always accommodated my special orders (no onions, no avocado, no nuts, etc.) My husband loves the red beans and rice and the ribs as well as the fajitas. I love the salads. My only lament is that they took Hermosa chicken off of the menu (only someone going there for decades would remember that). My building orders from Backyard Grill weekly! They are always professional, accommodating and will take an order at 11 am to be delivered for 4 pm and it’s fantastic! Thank you BYG, never disappointed over here! Great restaurant! My only complaint is that there are too many vegetarian options, can you please add meat to all the vegetarian options. I’ll be having awesome Backyard Grill steak and loaded tots today to celebrate my 100th birthday. Drop your e-mail address to get exclusive discount offers right in your mailbox. Looking for food offers in Restaurants located in Chantilly. 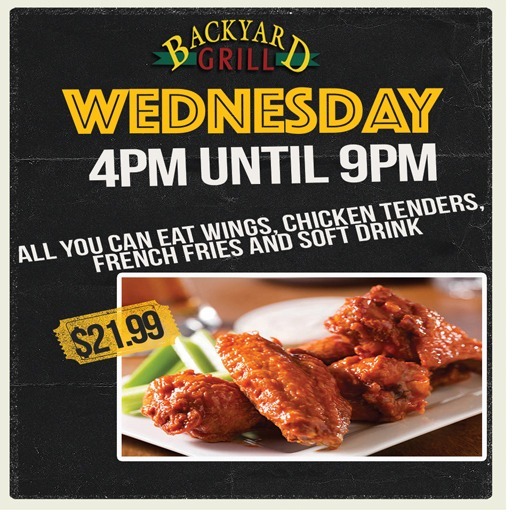 Visit Backyard Grill Restaurant in Chantilly. Backyard Grill Restaurant will use the information you provide on this form to be in touch with you and to provide updates and marketing.